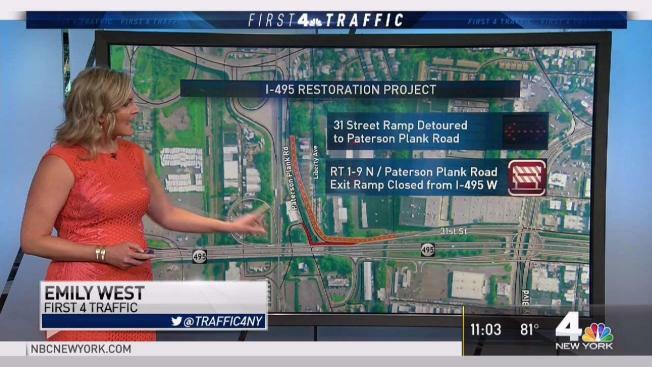 Emily West has your alternative routes for avoiding the construction during the I-495 restoration project. "Structurally deficient and functionally obsolete" -- never words you want to hear about a bridge that carries more than 150,000 cars a day on an artery crucial to transit in and out of America's biggest city. And yet, that's the status of the Route 495 Viaduct, part of the 3.5-mile freeway that connects the New Jersey Turnpike to the Lincoln Tunnel. The bridge must be partially replaced, a project that starts in earnest on Aug. 10 and is expected to take 2.5 years, during which time commuters will face multiple and persistent lane closures. The gridlock might be unimaginable. So, consider this a Route 495 Survival Guide. You can sign up here to receive email alerts from the NJ Department of Transportation about planned lane closures and pattern changes. Read below for the latest congestion reports from NJ 511, the state's traffic update service.